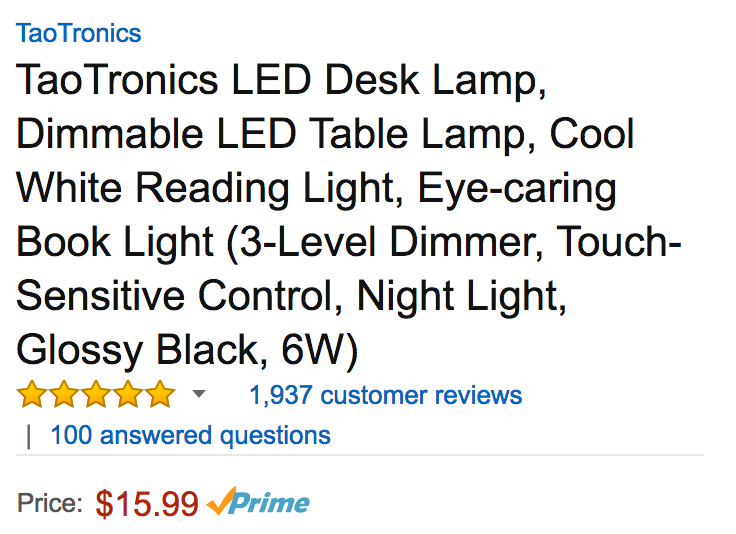 Sunvalleytek (99% positive feedback from 280,000 customers) via Amazon offers the TaoTronics 3-Level LED Desk Lamp for $15.99 Prime shipped. That’s down from the original price of $40 and an Amazon all-time low. Nearly 2,000 Amazon customers have left a near perfect 4.8/5 star rating. LED Desk Lamp with 3-Level touch dimming. TaoTronics Elune TT-DL08(Black) is the new generation energy-saving and eco-friendly LED desk lamp. Ideal light source for office, home, dorm, piano, etc. With its elegant and ergonomic design, this lamp is ideal for both home and office use. Package contents: 1 x TT-DL08 LED Desk Lamp 1 x AC Adapter (100V-240V) 1 x Quick User Manual 30 Day Money-back guarantee 12-Month TaoTronics Worry-free Warranty.